My original intention was to simply put up a tasting note for the wine at the bottom of this short piece, but I thought for a change the wine maker deserved more than that, so I have indulged myself with this draft. The Keller estate in the Rheinhessen has been there since 1789, Peter after attending the Geisenheim institute came back to his fathers winery in 1999 and took over the reins in 2001, the vineyards already included the Hubacker site and the Kirchspiel, , Morstein and Abtserde to name a few were added from his wife Julias family holdings shortly afterwards and rapidly became some of the greatest sites in all Germany as the quality level under Peter climbed ever higher. The Dalsheimer Hubacker site is the most famous yet all of these sites not long ago were not thought to be anywhere near the best even in the Rheinhessen at the time not the most celebrated area in Germany for wine making and not even in the best part of that area. Almost from his first vintage interest in his wines started to increase and soon he was winning more awards than anyone else in the region on an annual basis, this was coupled with an almost cult status and unfortunately a corresponding rise in the prices of his wines. 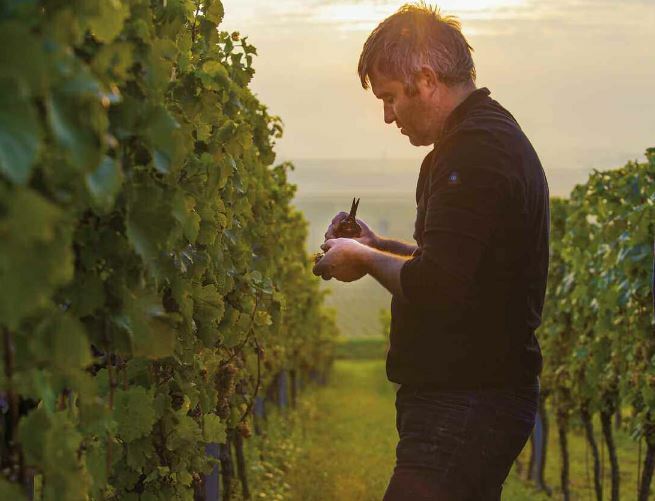 His dry GG wines, the G-Max cru being the most expensive dry Riesling available, available being sold out on release every year, even his Von Der Fells from young vines is quickly sold out such is the demand. In recent years he has purchased or leased sites in the more northerly parts of the Rheinhessen and only a couple of years back leased a site in the Piesporter Schubertslay in the Mosel, not an unnatural thing to do as his mother is from the Mosel and he has always had an affinity with the region, the first vintage from there is the 2018 and no doubt many are already wanting to get their hands on a bottle. Keller is not just dragging the region back from a long slump, those great estates living on their names for years after a period when they dominated German wines, but also inspiring other young winemakers to greater heights, Julian Haart worked with Keller and was instrumental in Kellers Mosel aquisition, they are also friends. His vision for wine goes beyond Riesling, he loves Burgundy and Jancis Robinson has called his wines the Montrachets of Germany such is their quality and style. His vineyards also despite being 77% Riesling and 16% Spatburgunder contain a bewildering range of grapes some in tiny quantities but all turned into wonderful examples of the grape, the list is long, Huxelrebe, Grau Burgunder, Weisser Burgunder, Scheurebe, Silvaner, Fruburgunder, Chardonnay, Optima, plus red and white blends and even, yes, a Liebefraumilch. The Rhinelands have benefited from his fame and many of those inspired or rejuvenated by his success are also producing some fine wines, in particular those GGs, a very long list of those could be put on here but examples are , Kuhling-Gillot, Battenfeld Spanier, these two are run separately by a husband and wife team, Von Winning, Von Oetinger, Shelter Winery, Hexamer are just a few and for the resurgent reds Bernard Huber, Holger -Koch and Meyer-Nakel are also at the head of many more. Keller was not responsible for all these but his push to get his vineyards and the region back on track and competing with the Mosel again is paying off, for years now Riesling has meant one thing, Mosel Saar Ruwer, they now have serious competition and that is how it should be, the Rhinelands produce a fuller expression of Riesling the area always has, it is a different interpretation of the grape. For Kellers wines the problem is not just of market demands, there is a big following in the states, but the resultant price rises, the Von Der Fells is the cheapest of his really good wines and if you can find it buy, I have only managed once and his G-Max and TBAs etc are stratospheric in price very difficult to come by, such is life, are they really that good, I can only speak of the Von Der Fells which I drank awhile ago and was as good as anything I have drunk it its class and the auslese here, expensive but I purchased three halves so not so bad. With my changing tastes this wine in a half bottle was perfect, just a glass was enough. "Wonderful, full fruit with enough acidity to cut through, long lingering stone fruits finish that just stayed and stayed. Much more full on than a Moselle but no worse for it, I shall wait to see how the other bottles evolve as they will, wonderful wine up there with the best I have had, I would just love to get my hands on a G-Max, but that is unlikely to happen. So I did and have to say this is true… if you find it buy.